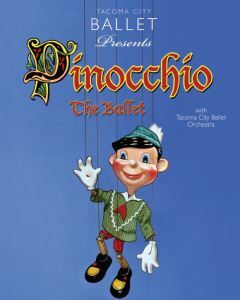 The Tacoma City Ballet returns to the Federal Way Performing Arts & Events Center with Pinocchio. Tacoma City Ballet’s Pinocchio, fashioned from the original Italian tale written by Carlo Collodi in 1883, is a delightful ballet perfect for the whole family. Come and share Pinocchio’s adventurous journey as he becomes a “Real Live Boy” and discovers those things in life that really are important. With marvelous dancing, gorgeous ballet music written by Russian composer Dmitri Shostakovich, and adorable scenery and costumes, Pinocchio is sure to be an entertaining ballet.